How did you end up getting the role of Pee Wee Reese? I went and auditioned in front of the casting director and then several weeks later, [writer-director] Brian Helgeland wanted a meeting, and I talked with him, and I actually auditioned again in front of him. It’s been a while since I had to go through a process like that, but this was a role that obviously I cared about and wanted to be a part of this movie and this story so it was well worth it. Why was it so important to you? Well just cause it’s got such an impact on the history of our nation and the history of baseball, and I just feel like it’s such a good story and a well-written script that it would be a fun project to do. 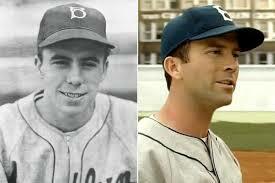 What did you know about Pee Wee Reese before you were cast in the role? Did you know much at all about him? No, I didn’t. I didn’t know hardly anything about him. But it was awesome to be able to learn about him and to portray him as a character and what he did for the game of baseball and how he was as a team captain, and how he accepted Jackie Robinson into the team. That’s what appealed me about the character. How did you do research about him? Through books? Or did you talk to people who knew him—family members or things like that? No, I didn’t talk to any family members, unfortunately. I would like to have. But most of it was through Rachel Robinson’s book that she had written about Jackie, and on the Internet—things like that. Did you get to meet Rachel Robinson at any point? Yes, we did. Yeah, she came to set for one day, and that was tremendous experience, meeting her and just her sharing some things with us there on set, and having her there and just seeing how well she was doing at her age was amazing. That was a special moment. We all got to meet her and got our picture made with her. It was a pretty big day. It was pretty hot outside, but we were actually shooting during a spring training day—there were a lot of extras there—she was a trooper, man. I think she’s 90 years old, and came out. Did she tell you anything specific about Jackie’s relationship with Pee Wee? No, she didn’t really get into details. She asked me if I had spoken with Pee Wee’s folks—Pee Wee’s wife actually passed away about a month before we started shooting, which was a disappointment because that would have been nice to meet her, but his kids were alive. She thought it would be nice to get in touch with Pee Wee’s kids just to let them know that he’s been represented well in the movie so I felt good about that. What did you find out about how Pee Wee was accepted by the Brooklyn fans? He was a Southerner, like you, from Kentucky. Did they embrace him as one of their own right away or did he have to win them over? Well, I’m not real sure, but I know he was well-received and well-liked. He was the team captain, and he was smaller in stature—that’s not the reason that he was called Pee Wee, actually. He was well-liked by the team, and I think it was more his personality and being charismatic when he had interviews or on and off the field—I don’t know how he interacted with the crowd, but I feel like his personality was a lot of the reason that he was well-received and well-liked. And plus, his play on the field and toughness. Now, the big moment where Pee Wee puts his arm around Jackie and has his picture taken—how important do you think that was historically in terms of making Jackie Robinson acceptable to the white public? Well, absolutely. I think it had a huge impact, and the main reason too is because a lot of the fans loved Pee Wee Reese and looked at him as an all-star baseball player and a person, and for him to make that gesture was really a shock to a lot of people and it kind of made them think differently. They figured it a guy like Pee Wee Reese was going to accept this man on his team and play baseball with him that maybe they might need to think a little differently, too. It was a huge step and that was kind of the first instance of a white player accepting a black player in baseball. And that’s why I figured they’ve got two statues—one in Brooklyn and one in Cincinnati still standing—because that was such a huge moment in the history of the game. The line in the film where you say to him, ‘Maybe we’ll all wear 42 tomorrow.’ Pee Wee apparently didn’t say that. Another player did. But Brian decided to give that line to Pee Wee. Were you aware that it was not historically accurate when you were doing the scene? Do you think it matters? I did not know that. I’m glad he gave that to me because I really like that line. It’s a great line with the whole idea that the number is retired forever. So I know that you’ve played football and golf and basketball—have you ever been a baseball player prior to this movie? Oh yeah. I played baseball growing up. Baseball and golf were my two best sports, but really, I grew up playing baseball more than any other sport. I played pretty much every position, but my main position was probably catcher and I played a lot of shortstop when I was little, and every now and then, I’d play centerfield, but usually catcher and shortstop were my main positions. Did you have to sharpen your skills to play this role? I did. It was really strange getting used to the new glove. The first week I was like, ‘I’m glovin’ every ball and everything is just bouncing off.’ You really had to teach yourself to have soft hands and to give into the ball. It reminded me a lot of today’s training where we use the mitts and use both hands to receive a ground ball—it reminded me of that because that’s how big the gloves were back then. They’re so small. I sent a picture that they took of me catching one of the ball, and people back home were like, ‘Are y’all playing with softballs? What’s the deal?’ because the ball looks so huge in the glove. And I’m like, ‘No, that’s the little bitty mitts we have.’ So that took some adjustment, and those old cleats took some adjusting too. We’re spoiled these days with the equipment that we got. They were tough back in the day. Do you have a favorite baseball team? Yeah, I follow the St. Louis Cardinals. I live in Missouri. I’ve been here 10 years. My wife is from here. Did you root for them growing up, too, or was that something you picked up since moving to Missouri? I did root for them, and then my family started watching the Atlanta Braves when they were a team in Atlanta because they were a little bit closer to us than the Cardinals, but my dad and grandparents, they all watched the Cardinals growing up because basically, that was the closest team for us in Alabama until Atlanta came. So yeah, I’ve been following them for a long time, but I’ve become a stronger fan obviously since I’ve moved here. Do you have a favorite baseball movie, aside from 42 obviously? Well, I like The Rookie a lot. My wife would be mad at me if I didn’t say The Natural, but it’s probably not my favorite. But I like The Rookie. I like them all, but probably The Rookie stands out the most. I’ve worked with Dennis Quaid—I like him a lot. How was working with Harrison Ford? You’ve worked with a lot of icons, and he’s almost in a league of his own. It was a real treat. No, not really. I just had the one scene with him really. 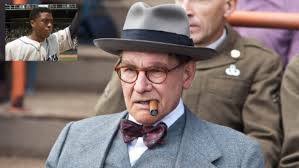 It was a treat to be able to work with him, and to see his character come to life. I really like how his character was written, and to watch him perform—it was a pretty neat experience. I thought he was great in the movie. I really thought it was one of the best things he’s done in a long time. Yep, yep. That’s good to hear. Chadwick Boseman—he’s relatively unknown taking on a big role. We’re you able to help him in some ways because you were in that position yourself at one point? At a younger as than he was, but did you find yourself helping him? Oh man, not at all. I didn’t have to, to be honest. When I saw that he was playing Jackie, probably like everybody else, I was like I hadn’t really heard of him. I had heard of some of these television shows he’d done, but he did a phenomenal job and such a hard worker. So really the only thing he got from me was just encouragement because I’d come up to him and say, ‘Man, I love what you’re doing. You’re doing such a good job and hard work.’ He got after it, man. He wanted to be there for all his baseball scenes and do most of all the running and all the hitting. It was impressive because his character—as much turmoil as he has to go through and then to get there emotionally, and then to be able to go out and perform on the baseball field and have fun and be gritty and run and slide, that was a tough role. He got after it, and I was just there to be a cheerleader, that’s all I was. Well, you’ve done a football movie with Friday Night Lights. You did a golf movie with Robert Duvall, Seven Days in Utopia. It is it just a coincidence that you’ve worked in the sports movie genre a few times? Is that an area that particularly interests you as an actor? Oh man, I’m so blessed. I’ve always loved sports. And just growing up in Alabama, that’s a main focus for us Southerners, is going out with a ball in your hand. So to be able to play these roles in sports films is just a blessing. I’ve been lucky and it’s so much fun just to be involved with the team aspect of the sport, and to portray a team on film is just as much fun. There’s as much camaraderie between the actors as the players—that makes the job a lot more enjoyable. I’ve been lucky to be in those sports movies and heck, I hope it continues and I’m in many, many more. So how did you originally get into acting? The War was your first film, and you didn’t have any real training as an actor. How did you get cast in that film? Well, my mom, she heard about the audition on the radio—they were just having open calls all over the Southeast because The War had like, I want to say 11 kid characters, and Jon Avnet was the director, he wanted kids that had never acted before, and so they all had to have Southern accents so basically the casting directors went all over the Southeast, and I went to one of them and they picked me out of a crowd of like 3,000. Then I went and auditioned in front of the director and they gave me the part so that’s kinda how I started. And after that, I got a small agency in North Carolina, and through them, I got the audition for Sling Blade, and right before I auditioned for Sling Blade, I actually did a TV pilot called American Gothic, but in between the pilot and the series, I got the part for Sling Blade, and after Sling Blade, that was kind of the career starter because it was such a big film and a classic. After that, it just kind of went on from there. It must have been daunting to take on the role in American Gothic—you were really the lead in some ways in that show. You were untrained, you were a kid—how did you handle the pressure? Oh man, I didn’t think about it. I got to give all the credit to how I was raised, to be honest, because I didn’t even think about pressure. I didn’t even know what that was, and even if I did, I probably laughed at it because my parents taught me that everybody’s equal so I really never was star struck or even thought about a judgment from others, and even if I knew they were judging, I really didn’t care. I’m just lucky I had that aspect in me as a young kid and I never really even thought about it. What did you think when you were making Sling Blade? Did you think it was going to be as huge as a phenomenon as it would become? Or just some small little movie that nobody would ever see? I had no idea. I had no clue. I didn’t even know what an independent film was. I didn’t know was a small movie is or a big movie. I just thought it was kind of fun being able to act with Billy Bob acting like he was [laughing]—saying lines with him. He didn’t tell me he was going to act that way, and I guess he wanted that element of surprise that we had in that first scene together at the laundry mat. I knew how it was written, but I didn’t really know exactly how he was going to play it so that was a unique experience and one I’ll never forget. But I just had fun with it, and never really did put any pressure on myself because it wasn’t that big of a deal to me. It’s like playtime, to be honest. I have an older sister—she’s 19 years older than me—so when I was young, she always had something going on with the camera, as far as playing doctor and I was the patient—she was working on me or she wanted me to sing something with her and putting wigs on me—so that like playtime to me so it didn’t matter. When I was a little kid in a movie, I felt like it was the same thing. Billy Bob is a big Cardinals fans, too. Did you ever tak baseball with him? Yes. He goes to the games a lot. I’ve seen him on TV—they usually show him. He played a lot of baseball when he younger. He was a really good pitcher. 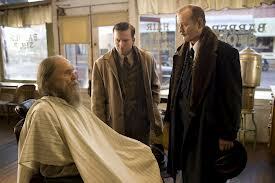 You’ve worked with Robert Duvall three times now. Is he a mentor to you? Oh absolutely. He’s awesome. He still calls me. I feel like he calls me every month. We just had a conversation about a week ago because he’s doing a movie called The Judge, and he’s playing the judge in the movie and I read the script, and we talked about it. But yeah, he’s an amazing guy. I love him to death. It’s so unique to talk to him and see his passion for good stories and good characters and still have his wits and witty about him at the age of 82. I mean, he’s wide open. I hope I’m as energetic as he is at the age of 82. I loved Get Low, by the way. What about working with Bill Murray? You hear so many different stories about how he is to work with—that he can be kind of difficult or he can be hard to read. Did you hit it off with him? Oh man, yeah. I had a blast with Bill Murray. It was a learning experience because he likes to try anything on film. It doesn’t matter—if it’s crazy out there, he’s gonna try and see where it goes—so I like that because it kept me on my toes and to be able to react from what he’s doing. And I think it made me better as an actor. So that was kinda a unique experience, and something that I take from that. Not that I was scared to try anything, but if I have some sort of an idea, like, ‘I wonder how that will come across on film or I wonder how that will play for my characters?’ Bill Murray, he wasn’t scared to try. Just off the wall something he says, or something he looks, he just wasn’t scared to try. So that was a learning experience for me to see a veteran like him and as experienced as he is to do things like that, he had no fear. That’s usually what we try to learn to do in life anyway, and same with playing sports—you gotta be fearless—so that was pretty unique to see. It’s a good learning experience. But we had fun. Did you ever play golf with him? We did play golf together. He always wanted to ride with me—we had separate cars, but he liked me and my wife, and he was like, ‘You guys just ride with us!’ And he would turn the radio wide open and we would sing the whole way home from the set to the hotel. It was a good time. One time, I got back earlier, it was before dark, and I came down with my clubs, and he was still down at the coffee shop getting a drink, and he said, ‘Where you going?’ And I said, ‘Well, there’s a driving range down the road. I was just going to play and hit some balls.’ And he said, ‘Well, hang out, I’m going with ya.’ And we went and we hit like 30 balls and he said, ‘You want to play par three?’ And I said, ‘I don’t care.’ So we went and played, and I’ve seen him play on TV, and I’m a pretty serious golfer, like I play competitive tournaments when I’m not working, and I’m constantly working on my game. So I didn’t know what to expect as far as how seriously he took the game—I just thought he would be out there joking around—but he really loves the game. I mean, we went out and played the par three, and he made two birdies in a row and I could tell that he was serious and having a good time. So that was cool to see and fun to be able to play golf with him. So it seems that when I look over your career, one of the things that I respect the most of you is that you’re always associated with very high quality projects—literary projects. All the Pretty Horses, Cold Mountain, things like that. is that coincidence? Is that luck? Or is that intentional? Well, I’d say both to be honest. I’m real fortunate to be able to work in some of those projects and the people I’ve worked with, but I’m also kinda picky of what I do, and a lot of those characters I like, and the reason I like them is because they’re written well so I’d have to say both because some of those I kind of didn’t expect to come way and they did and I was able to get the part. So that part was probably luck. But the other part, as far as me wanting to pursue them and wanting to be a part of them, wasn’t luck. Some of the stuff that maybe I’ve turned down or not shown as much interest in maybe opened up the door when I did have those other projects come on that I was able to pursue. I take it that you haven’t changed your accent at all and you don’t really want to for any roles. Does that hamper you in any way for the types of roles that you’re considered for? Well, yes. If I had to answer that honestly, I’d have to yes. Most of the time, if I play a role, it’s a Southern character. But I don’t have a problem with that. I have thought about trying to play a character without a Southern accent, but I’ve had such a good career with it and I feel like I’m a person who sticks to his roots and I take pride in that. But if the right character comes along and I feel like it’s worth it to change my accent for the role, I may give it a short—it’s not like it’s out of the question. But I’ve had fun being able to say that I’ve had the career I’ve had with the Southern accent that I have and stick to my roots. It seems like you’ve never played the stereotypical dumb, Southern hick character. Is that also a conscious choice on your part that you don’t want to represent your part of the country that way? Not really. I don’t mind. I can make fun of myself so if there was a comedic character out there, and I had to be in a comedy and make fun of some of the Southern culture, that wouldn’t bother me because I don’t take none of that to heart—I think it’s pretty funny myself the way some people stereotype us. Do you know what’s next for you? Do you have anything lined up? No, I don’t. I’ve just been reading scripts, but nothing really serious. And playing a little golf and enjoying life right now. I can’t wait to see 42. I haven’t seen it yet. So you’re in your thirties now. How does it feel? Do you feel like a grown up now? Oh absolutely, yep. I’ve always joked around with other people about being a man, and I tell them I’m not a man yet until I get married and have a kid. Well, by God, I’ve done that. I’ve got another on the way so really excited about that. Oh you do? Congratulations! When are you due? Thank you, I appreciate that. August. Do you know if it’s a boy or a girl? Or you going to find out? Yeah, we just found out today. It’s a little boy. Oh you’ve got one of each! That’s perfect! Lucky you. That’s wonderful. Yeah, I know it. We’re lucky, we’re blessed. Absolutely. So why have you never chosen to move to Hollywood or New York? Why do you stay in Missouri? Well, I got to feel like it’s the way I grew up and the way I was raised. I feel like pretty much that I would go insane if I lived in a big city. I’m not a big city guy. I grew up in a small community and I love being outdoors and love being in the woods. I’m a hunter and fisherman and a golfer so I stay outside constantly. Being surrounded by concrete buildings is not my taste. Are you a Lucas Black fan? Post a comment! I enjoyed this interview. Lucas Black is one of my favorite actors. I’m proud he’s from Alabama and has not forgotten his roots. Roll Tide! !